We had already been in Wyoming earlier during this trip — first with our visits on the west side to Grand Teton National Park and Yellowstone National Park, and later in the northeast part of the state and Devils Tower National Monument — so the goal of this leg of visiting Wyoming was to zigzag our way through the rest of the state, starting with Douglas and ending with Rock Springs… and what a joy this leg has been! While in Douglas, one must visit the Ayres Natural Bridge Park, which is located about 18 miles to the west of town. The park offers multiple picnic areas (with grills) for small and large groups, but the main feature is the 100-foot long by 50-foot high natural bridge — one of the few of its kind in the world with water (LaPrele Creek) still running underneath it. The bridge had been known by Native Americans, but gets its name from Alva Ayres, who settled in the area in the early 1880s. The bridge is located about a mile south of the Oregon Trail, and some emigrants are known to have made the mile diversion to see this natural phenomenon. The park also includes a cool oddity — the remains of an old two-story cement building once belonging to the North Platte Valley Irrigation Company that was going to supply water and electricity, but never got completed as the company went bankrupt before the project was finished. The town of Douglas is also quite interesting — and home to the jackalope, a mystical animal of North American folklore that is supposedly a jack rabbit with antlers. You can see pictures and sculptures of these animals all over town, but the folks at the Douglas Railroad Museum take it to an extreme — showcasing supposedly taxidermied examples of two types of jackalopes. Regardless of the jackalopes, the train museum is a must-see for train buffs like us. 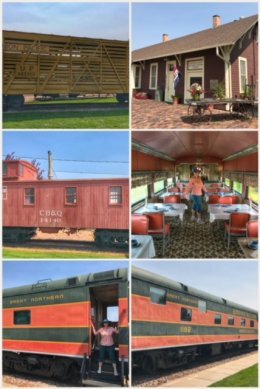 It includes several types of rail cars, including an old Pullman Sleeper and a dining car — both open to wandering inside to enjoy the history of how train travel used to be. The visitor center, which just opened this year, is located in the historic Fremont, Elkhorn and Missouri Valley (FE & MV) Railroad Passenger Depot. Next up on our travels through Wyoming was the town of Buffalo, located in the northern part of the state. 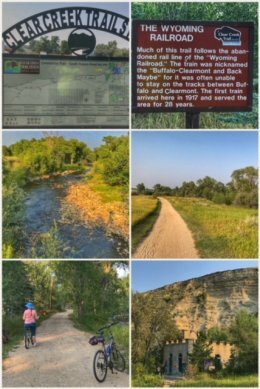 We started our adventure here finally back on our bicycles — with a 15-mile ride on a series of trails within the Clear Creek Trail System (parts of which follow the abandoned railbed of the Wyoming Railroad). We must say that Buffalo ranks up there with progressive towns that develop (and connect) walking and biking trails that allow people to enjoy nature. The ride took us along the creek, up through town, and along mostly rural areas. Our destination (and turn around point) was an old, abandoned hydroelectric power plant built in 1914 — and designed to resemble an European castle. It went through several owners before being abandoned. 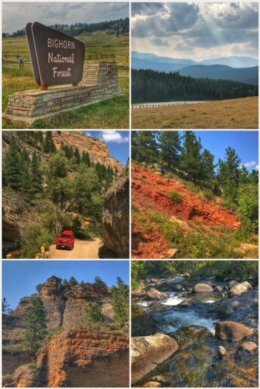 Next up while staying in Buffalo was a drive over to the Bighorn National Forest and a driving adventure up and through Crazy Woman Canyon. 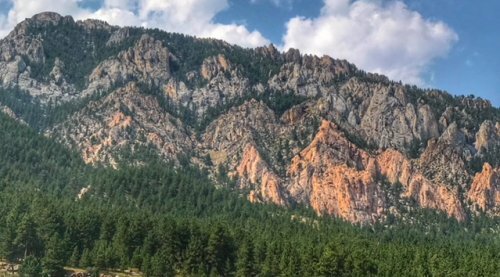 The Bighorn Mountain area is beautiful and diverse — and includes lush grasslands and alpine meadows, as well as rugged mountaintops and canyonlands. Be forewarned: Crazy Woman Canyon Road is unpaved and gets a bit rough in some areas; you may not need 4-wheel drive, but you will definitely want to be driving a vehicle with fairly high clearance for dealing with some of the rocks and ruts in the roadway — and avoid it in bad weather conditions … but, again, the drive through this tight canyon is so worth the effort. We stopped multiple times to admire the rock walls and creek, as well as hike a bit in the pine forest. 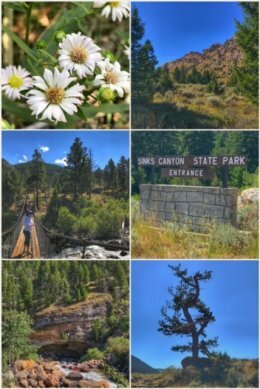 From Buffalo, we headed south to Riverton, Wyoming, with the primary goal of visiting Sinks Canyon State Park and the Shoshone National Forest. The park and the national forest are adjacent to each other, and we started the day in the national forest, hiking the Popo Agie Falls Trail, a 3-mile round trip which has some moderate elevation gains and a lot of rocky trail. The best part of the hike is that the trail follows the river up in the mountains — and the views of the river and cascading water over large rocks is pretty spectacular. We didn’t make it all the way to the main falls, as we had a bad night the previous evening — and wanted to conserve our strength for the next trail. 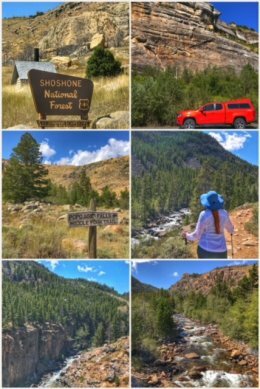 From that trailhead in the national forest, we doubled back into the state park and headed for the Popo Agie Nature Trail, which is located in the Popo Agie Campground. 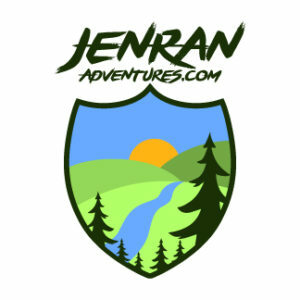 The nature trail is a 1-mile loop that is delightfully wonderful, taking you through river wetlands, sagebrush flats, and a pine forest in the foothills of the mountains. The hike is fairly easy and provides good signage for learning about the different ecosystems. On this day, we ended our trip at the state park’s visitor center, which is only open from Memorial Day to Labor Day. Near the visitor center is a very short trail that leads to an overlook of one of the cool sinks (underground limestone caverns). On our way back to camp, we had the wonderful luck of stopping and visiting four burros, including one baby… seeing these sweet and kind animals was a highlight of the day for sure! 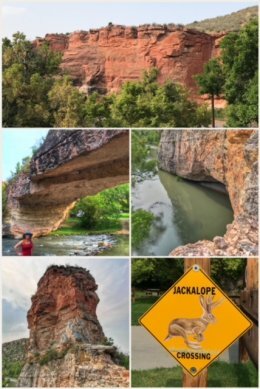 We ended our wandering in Wyoming in Rock Springs, near we had camped almost exactly a year ago as we were returning from South Dakota with our then brand-new camper. This time, we stayed for a few nights to enjoy some of the amazing scenery. Little did we know that we were about to encounter one of the highlights of this trip, which involved the Pilot Butte Wild Horse Scenic Loop. The 24-mile unpaved drive through Bureau of Land Management (BLM) land starts north of Rock Springs (and continues mostly along Hwy 53) and ends in Green River — though you can go in either direction. There are quite a number of good signage and vista points along the way. The BLM manages the wild horse population (all descendants of breeds introduced by ranchers in the 1800s), which hovers around 1,500 horses at any given time. But the highlight was not seeing a small herd of wild horses, but driving up to Pilot Butte (so named because early (1920s) pilots used it as a key navigation tool) and deciding to attempt — and SUCCEED — climbing to the top of the butte. 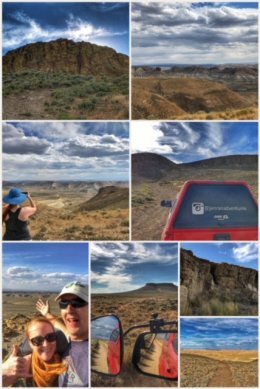 At an elevation of 7,900 feet, we could see in all directions; while up there, we enjoyed the adrenaline and pride from scrambling up a 20′ crevice to reach the top of the butte! We even did a Facebook Live post, but the wind was so crazy up there that the audio on that video is pretty bad. 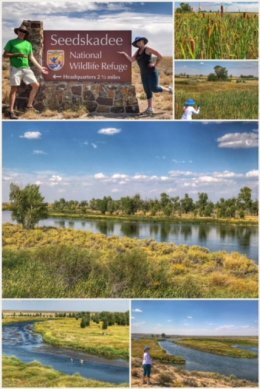 Next up was a return to one of our favorite types of parks to visit — a national wildlife refuge; more specifically, the Seedskadee National Wildlife Refuge, which was established in 1965. The Green River runs through this 27,230-acre refuge — an oasis in the high desert of southwestern Wyoming. As is fairly typical, we had the refuge to ourselves as we drove the auto route, mostly following the river. Happily, there are also various places where you can park and hike a bit through the refuge. We saw more prairie dogs and various waterfowl (including some pelicans and ducks), but the highlight for sure came as we were driving out of the refuge and a badger crossed the road right in front of us! We parked the truck and enjoyed watching the badger sitting by his den-hole trying to make sense of what we were doing. After about 10 minutes, he finally decided we must be okay and headed back across the road and off into the sagebrush! 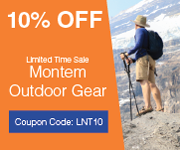 It is truly amazing what one can encounter in God’s beautiful creation if you simply get out there and spend as much time as you can in nature. 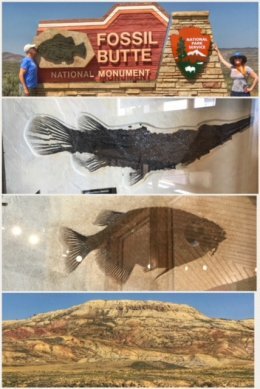 Our final stop in Wyoming — which we did on our way to our next campground in Utah — was visiting another butte, this one Fossil Butte National Monument, located just outside of Kemmerer. This park highlights and protects ancient (30-50 million years) animal and plant fossils associated with the sub-tropical climate of Fossil Lake (which was about 60 by 40 miles in size), the smallest lake of the three great lakes that were present so long ago in what are now Wyoming, Utah, and Colorado. One of the most amazing things we have learned on this trip is that most of this land was covered at some point by ancient lakes, shallow seas, and/or glaciers. Another amazing fact is that so much land has been eroded over time; the top of the butte was part of the lake bed so long ago! The visitor center offers a very informative video about the fossils — many of which contain almost complete details of the fish and plants, including entire skeletons; you also learn how scientists extract the fossils from the rock. Several hikes can be enjoyed within the park, but because we were on our way to Utah, we spent most of our time at the visitors center. Next up? We will be back to adding lots more national parks and monuments to our list as we spend five weeks or so in Utah!